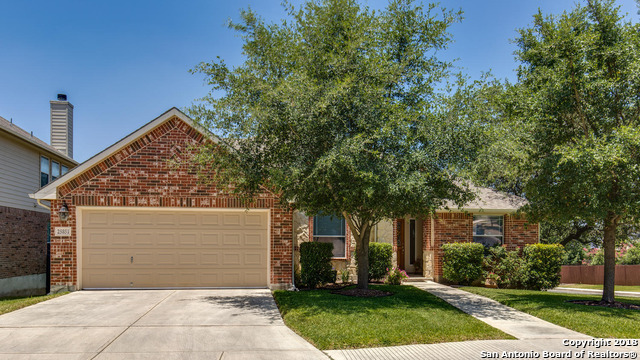 All THE PRESERVE AT INDIAN SP homes currently listed for sale in San Antonio as of 04/26/2019 are shown below. You can change the search criteria at any time by pressing the 'Change Search' button below. "This is THE HOME you have been waiting to hit the market! Seriously, you are going to fall in love with this incredible 4 bedroom home in Indian Springs. The layout is well designed, w/all bedrooms on the main level. The master is split as is a separate bedroom/bath - great for guests! This home is loaded with upgrades & designer features throughout and the gourmet kitchen is chef's dream! The community offers a fantastic pool, park & playground and is conveniently located to 281, shopping, dini"
"$2000 appliance allowance given at closing!! 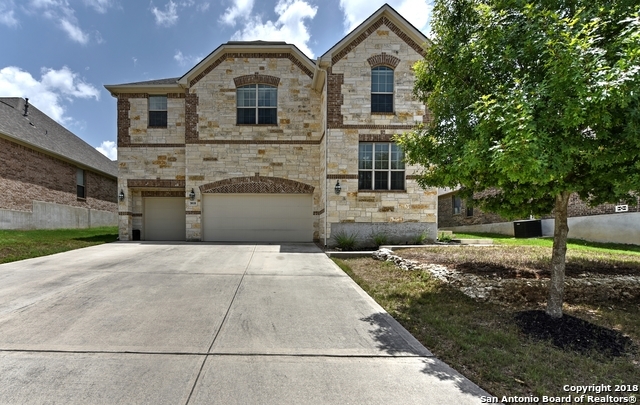 Enjoy gorgeous hill country views & 4 beds, 3.1 baths in a well-appointed floor plan. Seamlessly integrated office, media & game room. Over sized island kitchen, solid granite counters & upgraded lighting. Tile floors provide minimal maintenance. Downstairs Master has huge windows filling the space with light & beautiful scenery. Generous backyard has an extensive, covered deck overlooking lush, mature trees." "Stunning dark wood floors enhancing the lofty open floor plan. Spacious kitchen for the cooks in the family. 42 raised panel wall cabinets, granite counter tops and gas cook top. Separate dining room for entertaining. Separate mother-in-law suite-bedroom and bath downstairs. Roomy master bedroom and bath upstairs. Over-size game room and bedrooms. Lots of closets for storage. You'll love the neighborhood amenities. Welcome home! Only 9 years new!" "Gorgeous 2-story Lennar Home in desirable Preserve at Indian Springs!1st Floor includes spacious Mstr Bdrm,Guest/mother-in-law suite w/a full bath & study on 1st floor.Isld Kitch has a beautiful stone accent wall over gas cooktop,SS appliances,and granite counter tops. Lrg gameroom upstairs with 2/add. spacious bdrms and full bath.Enjoy entertaining in the backyard featuring a cvrd patio & multi-lvl deck. Take a dip in the Neighborhood pool, play in the park or have a picnic! Come and see before"
"Stunning SINGLE STORY w/BONUS GAME/MEDIA up. Located on a beautiful corner lot. Exquisite stain resistant PORCELAIN TILE, Bright & cheerful eat in kitchen w/granite counters, EXPOSED STONE, GAS COOKING, brkfst & coffee bar. Views of backyard w/mature oaks. Family room w/stone fireplace. Formal dining PLUS STUDY. Master retreat w/high ceilings, mill work. Spa like bath w/sep vanities, tub & shower. Gorgeous backyard w/cvrd patio/deck & flag stone garden. Sprinkler, softener, gutters, security. 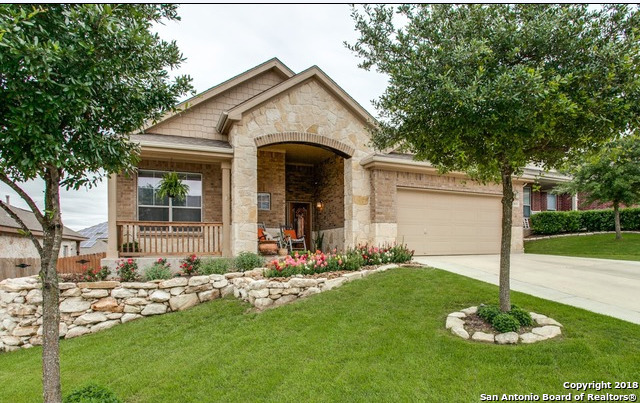 RO"
"Live the Texas hill country dream with a manicured, suburban location. Step into the versatile floor plan including 2 light & bright living spaces, 4 beds, 2.1 baths, & study. Exquisite stonework, granite counters, & large island emanate style throughout the kitchen. Enjoy wood plank tile floors & extraordinary spaces for entertaining with formal & informal dining areas. Unwind on the covered veranda & extended deck. This luxe home offers desirable lifestyle in a sought after location. Open Hous"
"*OPEN HOUSE MAY 4th & 5th (12-4)* Come see the STUNNING views of the Hill Country this home offers, from it's elevated lot. Nicely tucked away on a cul-de-sac. OVERSIZED Lot. This home offers Open Concept Living, Master Suite down, Game Room and a Theatre Room w/Elevated Seating. Most rooms are pre-wired for wall mounted TV's. Energy efficient living with the foam spray in insulation. A MUST see!" "This 4 bedroom cul-de-sac home has a fantastic floor plan, is sparkling clean and ready for move-in! It boasts a stunning gourmet kitchen with walk in pantry, built-in stainless appliances, a gas stove, granite countertops and a large breakfast bar. The home has a formal living/dining room, an office and a large game room. 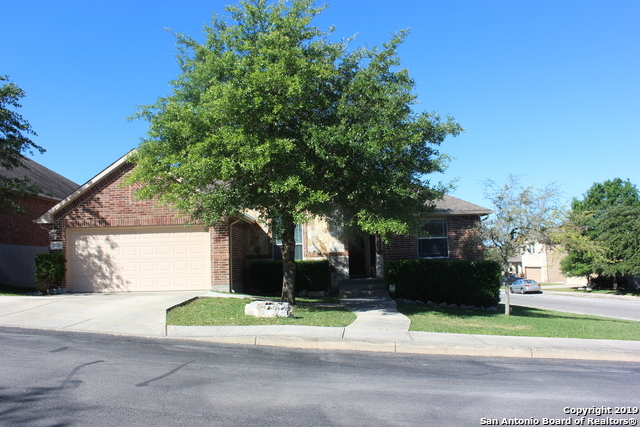 The large, flat back yard has mature trees and a relaxing covered patio. Excellent schools and just a short walk from the fantastic community pool & park. Priced to sell quic"
"Spacious Well Maintained 4 Bedroom, 2.5 Bath with a Study, and with a Loft / Game room upstairs. This is the only room upstairs. All wood & tile throughout this gorgeous property. Corner Lot. Granite counters, tile backsplash. Includes Sprinkler system and the Garage was finished with epoxy flooring." "*OPEN HOUSE w/ a Easter Bunny 4/20 11-2* Beautiful 4br+Study+GameRm+MediaRm. The HOME THEATER alone puts this home apart from others in the neighborhood. $20k put into the media room for family entertainment! Features 4 leather chairs/granite bar top/sound absorbing panels/100 screen/5.1 surround sound/1080P projector/wireless HDMI & more! Fresh coat of paint throughout. Extra storage racks in garage, master bath, laundry room. Pool table, washer&dryer, s/s appliances convey! Backyard views of H"
"Recently remodeled in true HGTV fashion.Light & bright inviting foyer with vaulted ceilings, ship-lap accent wall in front dining room & a beautiful wood pallet accent wall in the upstairs media room. Many upgrades throughout including ceramic wood tile floors downstairs, fresh paint, updated kitchen backsplash, & an updated fireplace to match! This home shows like a model, bring your buyers! 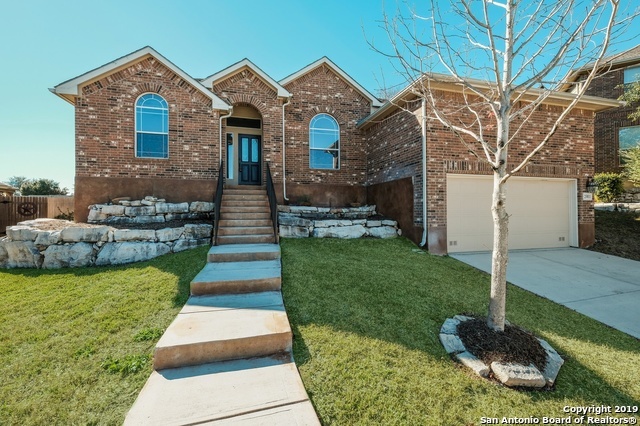 This one surely wont last at this price point in this highly sought after neighborhood and school distri"
"Built in 2008, this San Antonio two-story offers a loft, hardwood flooring, a fireplace, and a two-car garage. A recreation center, a community park, and a pool are part of the Indian Springs Residential Community. This home has been virtually staged to illustrate its potential! Thanks for viewing! Home comes with a 30-day buyback guarantee. Terms and conditions apply." "Beautiful,renovated one story home. Home has upgraded cabinets, black appliances,granite counter tops, tile back splash,Recess lighting, pendant lighting. They have replaced carpet from master and bath for stained concrete, Custom shelving for shoes! Back yard is perfect for entertaining with a re-done decking, privacy curtains on deck, wired for sound and TV,front and back sprinklers, grown trees with a beautiful view! Fresh paint through out. Come see this well maintained beautiful home before"